An observer, be they at a mountain top observatory, or in their own back yard must, at all times contend with the Earth’s atmosphere. It is a notoriously unpredictable and limiting factor in obtaining fine views of the Planets, and close binary stars. Many often comment, especially here in the UK that seeing is all too often mediocre on most nights, but what are the factors that contribute to this?. Are there ways and signs, which indicate whether the atmosphere, will be stable or turbulent on a given night?. So what exactly is atmospheric seeing? - it is high frequency temperature fluctuations of the atmosphere, and the mixing of air “parcels” of different temperatures/densities. This behaviour of the atmosphere is seen at the eyepiece as a blurred, moving, or scintillating image. There are roughly 3 main areas where Atmospheric turbulence occurs. Near ground seeing (0 – 100metres or so.) central troposphere (100m – 2km), and High troposphere (6-12km.) Each area exhibits different characteristics, which are explained in more detail below. Lower Altitude Effects: The air near the ground is where the great majority of turbulent airflow of the atmosphere occurs, which of course happens to be the area where the great majority of amateur observers are located!. This is caused mainly by areas (houses, other building etc) of varying density radiating heat differently, resulting in local convection currents. This is caused when the Sun heats the ground during the day, and the heat is then radiated away at night. An un-varying topography, such as grassy fields, and large bodies of water are favourable to observe over, at they radiate the stored heat from the day more slowly and equally. Also the telescope itself can perturb the image, if it hasn’t reached ambient temperature, this will result in a “boiling effect” when viewing. One should leave their scope for at least 1 hr prior to observing and probably longer. Also certain types of telescope and observatory are more prone to turbulence. Newtonian reflectors can be troublesome if not properly ventilated, as can Schmidt Cassegrain’s if not left to cool for long enough. As for observatories, Domes have poorer characteristics for stable seeing than run of roof designs. Mid- Altitude Effects: The turbulence at these altitudes is determined largely by the topography upwind of the observing site. Hence again, living downwind of a large city, or densely populated area, mountain range or other very varied topography will perturb the atmosphere. Downwind of a mountain peak will disrupt the airflow into turbulent eddies, resulting in scintillating images. This effect can prevail as far as 100km downwind of the peak. In this aspect, it is best to observe where the prevailing winds across your site have travelled over an unvarying terrain (large body of water or hills/fields for many miles upwind of the site.) This will help produce a laminar flow, and stable images. High Altitude Effects: Effects at this altitude are caused by fast moving “rivers” of air know as Jet streams. Wind shears at around the 200-300mb altitude level can cause images to appear stable, but very fuzzy, and devoid of fine detail. There isn’t anything the observer can do to prevent these effects, but forecasts are available, to help predict weather a Jet stream is present over your area. Areas of the Northern hemisphere most affected by the Polar jet stream are the Central US, Canada, North Africa, and Northern Japan. The Jet stream’s position varies with the seasons, tending to move further South during the winter and spring months. 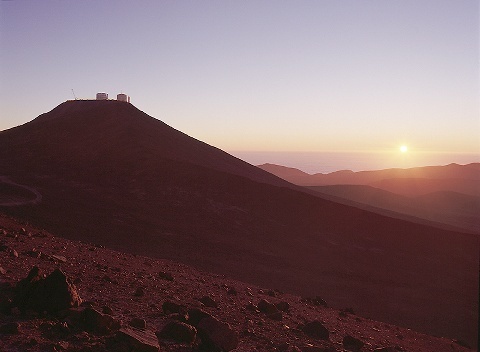 The world’s finest locations for a stable atmosphere are mountain top observatories, located above frequently occurring temperature inversion layers, where the prevailing winds have crossed many miles of ocean. Sites such as these (La Palma, Tenerife, Hawaii, Paranal etc) frequently enjoy superb seeing much of the year, (with measured turbulence as low as 0.11” arc seconds occurring at times) due to a laminar flow off the ocean. Sea level locations, on shorelines, where the prevailing winds have crossed many miles of ocean (Florida, Caribbean Islands, Canary Islands etc) can be almost as good, and generally very consistent and stable conditions prevail there. Also a major factor is generally unvarying weather patterns, dominated by large anti-cyclones (High pressure systems.) Areas outside these large high-pressure systems have more variable weather, and are more prone to a more variable state of atmospheric stability. Other, less well know locations where excellent stability prevails are the Island of Madeira’s highest point (Encumeada Alta, 1800m) where seeing is better than 1” arc second 50% of the time. At Mount Maidanak (Uzbekistan, 2600m) the median seeing value observed from 1996-2000 was just 0.69” arc seconds, presenting a site with properties almost as good as Paranal and La Palma. So is it possible to predict Atmospheric seeing with any accuracy?. The answer to this is yes, most of the time. For example poor seeing will almost always occur after a cold front has passed over, replacing the warmer air, with cooler air, which often gives rise to local convection, and turbulent skies. However, preceding a cold front the air is warmer, and more stable. This is especially true when a large High-pressure system has been present, and mist or fog forms. At these times, transparency can be reduced, but seeing can be excellent. It is also my experience that strong winds are often associated with poor seeing. Another thing to look out for is what type of clouds are present. Lots of cumulus forming in the afternoon due to convection will probably mean seeing will be poor for several hours after sunset. However if the winds are light, and high altitude cirrus shows a smooth linear pattern, this often indicates that the seeing will be good. It was also once thought that maritime locations were far from optimal for good seeing conditions, but as we have seen earlier in the article this is often far from the case. An even easier way to quickly gauge if a given night will present fine telescopic views is to simply see how much the stars are twinkling. If they twinkle little, and slowly, it probably indicates seeing conditions are reasonably good. However, if they are twinkling madly its probably a sign the views will be poor. This basic method does work quite well, but isn’t 100% accurate. Nights when fast, high altitude turbulence prevails will not show itself as noticeable twinkling, and one must simply look through their telescope to see what’s happening. Figure 03: Above is a diagram showing a cold front, and associated air masses. The air preceding the front is older, and warmer, and generally quite stable as the ground/air temperature difference is small. However, after the front passes, the warmer air is replaced by cooler air, resulting in significant local convection causing turbulence. Seeing wont improve until the ground/air temperatures again equalize – this usually takes several hours. p1. Star image is usually about twice the diameter of the third diffraction ring if the ring could be seen; star image 13" in diameter. p2. Image occasionally twice the diameter of the third ring (13"). p3. Image about the same diameter as the third ring (6.7"), and brighter at the centre. p4. The central Airy diffraction disk often visible; arcs of diffraction rings sometimes seen on brighter stars. p5. Airy disk always visible; arcs frequently seen on brighter stars. p6. Airy disk always visible; short arcs constantly seen. p7. Disk sometimes sharply defined; diffraction rings seen as long arcs or complete circles. p8. Disk always sharply defined rings seen as long arcs or complete circles, but always in motion. p9. The inner diffraction ring is stationary. Outer rings momentarily stationary. p10. The complete diffraction pattern is stationary. Note: On this scale 1-2 is very poor, 3-4 is poor, 5 is fair, 6-7 is good, 7-8 very good, and 8-10 excellent. Seeing in the USA/UK - Good or bad? As I have mentioned, the local geography of a location plays a major part on how steady the seeing will be. In the United States, certain locations are in general much more favourable than others. The best states are in General those close to the Southeastern side of the continent. In Florida (the eastern sea-board especially) from Miami to Key West enjoys stable seeing throughout the year due to its consistent high pressure systems, laminar flow off the Ocean/Gulf of Mexico, and temperature inversions that form close to the eastern coasts. Average seeing here has been reported to be better than 1” arc second most of the year. Other good locations are the Gulf coast, and Arizona. The more northerly US states toward the Canadian border often have poorer seeing due to the frequent presence of the Polar Jet stream. As for the United Kingdom, over the last 3-4 years I have paid particular attention to how the seeing has behaved at my own location, which was in Kings Lynn Norfolk until Dec 01, and now Rochester, Kent (both in the South East of the country). Seeing at the Kings Lynn site (located on a balcony, around 3 miles from the North Sea coast, and 30ft above ground level) proved quite consistent during the 1998 to 2001 period. At Rochester, Kent (Near the South East Coast of the Country) at about 100m altitude presented quite consistent good seeing during 2002. 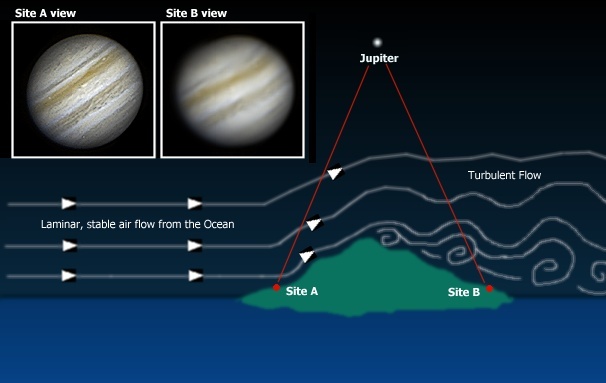 Fig 04: Above is a chart showing the observed conditions at my observing sites over 3 Jupiter apparitions. The results show sites with reasonably good stability. The data revealed the best seeing usually occurs during July-October, with the poorest seeing occurring during December, but again improving during February March. Its worth noting that the best seeing occurred during periods when the weather was more settled for a few days, which rarely occurs in the UK Winter. Nights of high humidity were often good (as many observers say) but not all. Seeing was always good when any fog/mist was present. Fig 05. A drawing of Jupiter by the author, simulated to show 3 different views as a high quality 25 cm reflector would show the Planet at powers of 350x. (far left) under excellent seeing, (centre) under fair seeing, and (far right) very poor seeing. For many observers, it will be a matter of patience before that night of great seeing occurs, and I advise the observer to not miss nights that may present the right meteorological conditions as I’ve described. When it does, it’s a memorable experience. Under these conditions (provided the scope is of good quality, and properly collimated) one suddenly realises the amazing capabilities of the amateur telescope. The smallest details become visible on the disk of Jupiter, with an intricate maze of colourful detail presenting itself. Saturn’s often mostly featureless disk, suddenly transforms into a planet of fine belts and zones, with wonderful colours visible in larger telescopes. But the Planets aren’t the only objects, which will captivate the observer. Globular clusters, and close binary stars appear as sharp as is possible, with almost 3-D views. Above all though, make sure you enjoy the experience, as it doesn’t happen very often. Many will perhaps only get a couple of nights during the whole year with such conditions, whilst others in favored locations will have many. Either way, it helps us all to appreciate the universe in which we live just that little bit more clearly. 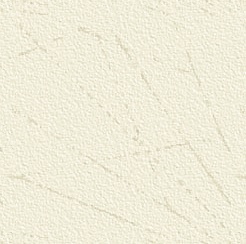 Copyright © 2003-2004. www.damianpeach.com. No material used within this website may be used, amended or distributed without the consent of the webmaster.